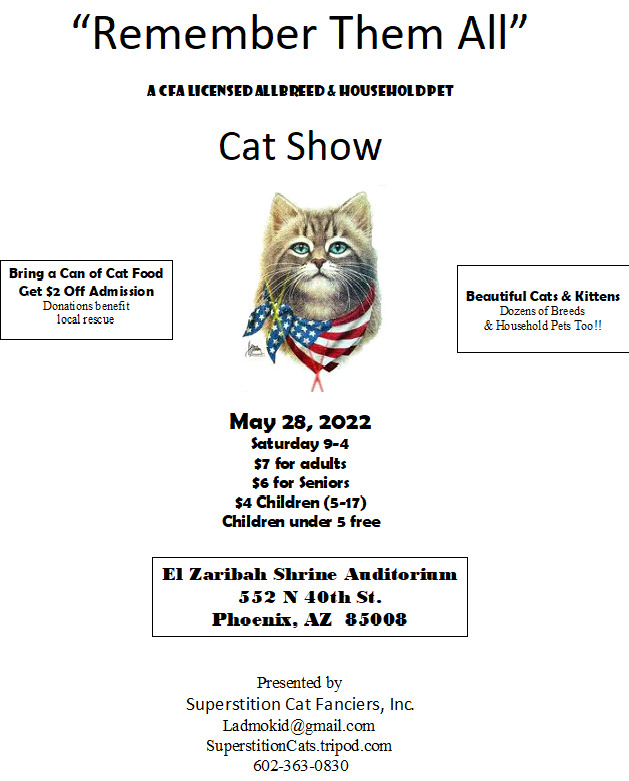 This site is the internet home of Superstition Cat Fanciers (SCF), a CFA Allbreed club located in Phoenix, Arizona. 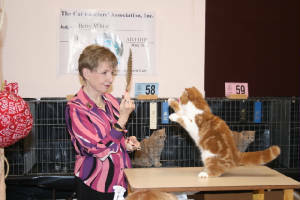 SCF is currently hard at work on its "Halloween Cats" cat show in Phoenix on Saturday, October 20, 2018. So far, it's shaping up to be a great one!!! The Shrine Auditorium is located at 552 N. 40th Street in Phoenix. Admission: $6 for adults, $5 for seniors, $3 children (5-17). Are you an exhibitor looking for a show flyer? Did you know you can show your own cat in the household pet division? To be shown, all household pets (HHP) must be at least 4 months old, not declawed, and in good health with no evidence of fleas, ear mites, etc. Cats 8 months of age or older must be spayed or neutered. Click here for more information.